Canola growers across the Prairies fund dozens of research projects with their levy payments to Alberta Canola, SaskCanola and Manitoba Canola Growers Association. Many of those projects are funded through their joint Canola Agronomic Research Program (CARP), which has been going for almost 30 years. Other projects are funded through arrangements with other organizations listed in these summaries. Here are short descriptions and updates for ongoing projects directly funded by provincial canola grower organizations. See below for a glossary of all abbreviations. 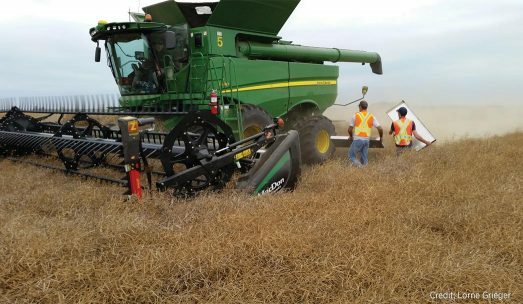 Purpose: In response to interest among canola growers and equipment manufacturers, a project was initiated in 2012 at Indian Head, Sask., to evaluate canola performance at row spacing up to 61cm. Three separate field trials were designed to evaluate row-spacing implications for side-banded nitrogen (N), seeding rate recommendations and crop competition with weeds. Progress: Despite high weed pressure, a single in-crop herbicide application kept weed competition acceptably low at all row spacing levels. Increasing row spacing resulted in slight but significant delays in maturity, but delays caused by row spacing were usually much smaller than those caused by nitrogen (N) fertilizer or seeding rate. Results to date suggest that N requirements of canola are likely similar regardless of row spacing, particularly for the range of 25-41 cm. Data from 2016 was not available at printing, but data from previous years showed minimal or no yield loss at wider spacing. In Chris Holzapfel’s row width research, the canopy took longer to close in at 61cm (24-inch) row spacing, as shown. Canola at this wide row width also had more weed pressure, more lodging and some delay in maturity compared to narrower widths. Purpose: Precision planters provide superior depth control and seed distribution over conventional seeders, and thus have the potential to improve the proportion, uniformity and rapidity of canola emergence. This study hopes to explore optimum row spacing and seed-safe rates with in-row liquid phosphorus fertilizer. Progress: Six trials were planted in southern Alberta in 2016. All trials have been harvested but analysis of data was not complete at the time of printing. Purpose: This project is investigating the inter-relatedness of the potential for different forms of dormancy, seed biology characteristics and seedling vigour traits across a diversity panel of Brassica napus lines. It will also investigate the effect of maternal environment and source seed processing on enhancing or diminishing dormancy potential of canola seed. Results will guide plant breeding to ultimately reduce the secondary or inducible dormancy potential of canola. potential within current commercial seedlots. Purpose: To determine the effect of foliar-applied phosphorus (P) on crop (canola, wheat, pea) response and residual soil phosphorus fertility in comparison to soil-applied phosphorus. 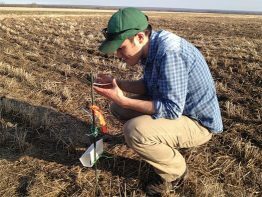 Progress: The study began in spring of 2016 with four field-research sites selected across the Brown, Dark Brown and Black soil zones of Saskatchewan. Different treatments of foliar-applied orthophosphate solution were applied mid-season to canola, wheat and peas. Some treatments were in combination with granular monoammonium phosphate (11-52-0) applied with the seed. Plant samples were obtained for analysis before and after foliar P application. Harvest samples were analyzed for yield and contents of total P, phytate, zinc and iron to determine crop recovery of P and the impact of the treatments on the nutritional quality of the grain. Soil samples were taken after harvest and analyzed for available P forms. Soil was also collected in fall of 2016 from sites for controlled environment studies to evaluate the effect of different foliar P forms and rates on the crop P nutrition and the fate of the P in soil and run-off water. Field trials will be repeated again in 2017. Jeff Schoenau’s assistants seed plots for his work on foliar-applied phosphorus. Purpose: This research investigates whether current phosphorus (P) fertilizer recommendations are adequate for high-yielding cultivars and if all fertilizer P needs to be seed placed. It also examines if current recommendations regarding safe rates of P and sulphur (S) are suitable for typical knife or hoe openers in use today. Progress: In 2016, trials were conducted at three sites in Saskatchewan (Melfort, Scott and Indian Head). Results are being compiled as yield data is available and the annual report will be submitted in early 2017. Purpose: This project aims to provide improved access to Saskatchewan soil information, both desktop and mobile. In addition, it will explore ways to enhance and utilize this soil information, including digital soil mapping at a resolution and scale useful for precision management and applications that allow producers to upload and integrate their own field-scale data to inform nutrient management decisions. Progress: As of October, an early prototype of the soil information storage and access framework is in place, including the web interface for accessing and querying information. 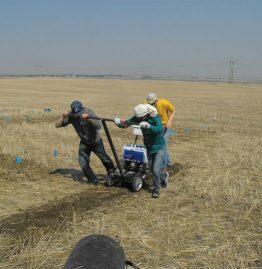 As harvest wraps up, researchers are collecting information from test sites to begin work on refined soil maps using digital soil mapping techniques. Purpose: Previous research found a higher potential for nitrous oxide (N2O) emissions from decomposing canola (and flax) residues compared to wheat or pea residues. This project aims to identify the reasons for this and provide guidance for future studies to develop and test strategies to minimize N2O emissions from oilseed residues and retain more residue-derived N in the soil for subsequent crop growth. Progress: Year 1 involved isotopically labeling the test crops (canola, flax, pea and wheat) with 15N and 13C by growing the crops under controlled conditions in a greenhouse. At maturity, the plants were harvested and the seed, above-ground residue, and below-ground residue (roots) were separated, weighed, dried and analyzed. Biochemical and isotopic characterization of the different crop residues is currently underway. Purpose: This project aims to validate a list of the reliable microbial associates always present and abundant in the canola root microbiome, while determining crop rotations that favour the establishment of a beneficial root microbiome in canola-based rotations. Progress: Two field experiments were planted and sampled in 2016. 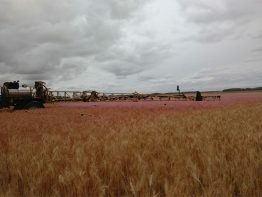 At Indian Head, Sask., plots were sampled at the vegetative and full-bloom stages from three cropping systems. In Swift Current, Sask., samples were taken at full bloom from three levels of previous crop that will be followed by five different Brassica crops, including B. napus. DNA is being analyzed to describe crop root and rhizosphere microbiomes. The beneficial nature of the microorganisms is being determined based on identity and abundance of important functional genes, as well as on crop performance. Can harvest weed seed management be used to control kochia, cleavers and wild buckwheat? Purpose: The study has two main objectives: (1) To determine the timing of seed shed in kochia, cleavers and wild buckwheat to determine whether their seed dispersal can be managed effectively at harvest. (2) To see if pre-harvest herbicide can reduce viable seed production in these three weeds. Progress: The project is in its final year and results are promising. 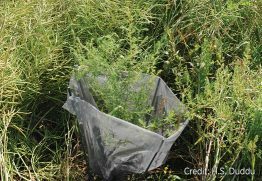 Kochia, wild buckwheat and cleavers retained on average 98, 90, and 91 per cent of their seeds at harvest, respectively. This indicates high potential for weed seed removal from the field with a timely harvest. Viability testing is currently underway to determine the efficacy of pre-harvest herbicide application in reducing weed seed survival. Researchers monitor these mesh traps to determine the timing of seed shed for kochia and other weeds. Credit: H.S. Duddu. Purpose: This project aims to determine the base germination temperature of several cleavers populations in Western Canada and determine the influence of chemical desiccants on cleavers seed properties. Progress: The first year of desiccant field trials were completed and data has yet to be analyzed. The base germination temperature experiment is currently underway and will be completed in December 2016. Purpose: The primary objective is to validate lygus threshold derived from cages in commercial canola fields. Secondary objectives are to assess insecticide sprays for other pests such as flea beetles or cabbage seedpod weevil on canola yield and relate landscape features to lygus distribution. Progress: Lygus were very scarce throughout the Prairies and Peace River region in 2016. The study was completed at two sites near Claresholm in southern Alberta. One farm was sprayed for flea beetles in southern Manitoba. The study has been extended for another three years to include more fields in the three Prairie Provinces. 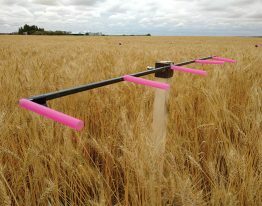 Researchers looking at spray deposition from self-propelled sprayers use coloured drinking straws to collect spray. The spray contains a fluorescent dye, hence the pink everywhere. In the lab, they wash the dye from the straws and measure the fluorescence to quantify the deposit amount. Purpose: This study will measure the spray deposit at 30 points along the boom to understand how travel speed, boom beight and nozzle choice affect the amount received by the crop and also how variable that deposit is. A more variable deposit means that some parts get too much and others too little, which can affect overall spray performance. growing season and results were not available at the time of printing. Purpose: Changing precipitation and temperature patterns will cause significant yield losses if drought and heat waves become more common. The project evaluates spring canola lines for drought, heat and combined stresses in greenhouse and field conditions. The study employs physiological approaches to identify donor parents for stress-tolerance breeding. Progress: Work is in progress to screen diverse spring canola lines under controlled greenhouse conditions at AAFC to better understand stress response on flowering and yield. Purpose: The ‘gold standard’ mammalian safety toxicopathological tests are very sensitive and veterinary pathologists use them to detect sublethal toxic effects of candidate drugs, pesticides and other chemicals in laboratory animals in order to determine the safe dose range. Comparable approaches have not been developed for honey bees. WVCM has the expertise and research capacity to adopt this mammalian ‘gold standard’ safety evaluation to honey bees and to determine the safe dose range for the three most commonly used neonicotinoids in agriculture. Progress: Adaptation of mammalian safety histopathology tests to honey bees has begun. Researchers are assembling databases of normal histology of larvae, pupae and adults of honey bee workers, drones and queens that will be used for subsequent testing. A researcher checks the cages used to experimentally exclude pollinators and/or wind on commodity canola plots. This technique is used for the pollinator studies. Purpose: This project is to quantify the contribution of managed pollinators to canola yield, and to provide management guidelines to maximize both pollination and bee health. Progress: Year 3 of 3. Insect visitation of commodity canola flowers tends to decrease with depth into a field, whereas the volume of nectar available to pollinators tends to increase with distance from the field edge. Researchers are currently processing canola plants and pods to correlate yield metrics with bee abundance. Experimental data on pollen collection from summer 2016 will be used to compare the economics of pollen versus honey collection by beekeepers whose colonies are rented out to pollinate hybrid canola seed production fields. Observations in hybrid seed fields indicate numerous behavioural interactions within and among pollinator species. Female leafcutter bees transfer the most pollen to previously unvisited flowers. 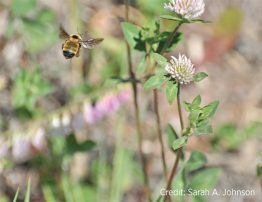 Leafcutter bees are also more likely to switch from a male to a female plant when foraging, thereby increasing the likelihood of transferring pollen. Getting more bang for your buzz: does pollination compensate for canola yield loss under sub-optimal moisture, nitrogen fertilization, and/or seeding rate? Purpose: This study will test if pollination can compensate for canola yield loss under sub-optimal moisture, nitrogen fertilization and/or seeding rate. Progress: Year 1 of 3. Greenhouse trials will start this fall at AAFC Lethbridge. The team has agreements with multiple seed companies, and has acquired the 25 varieties of canola seed to get started. Further experiments will start in spring 2017 in Beaverlodge. 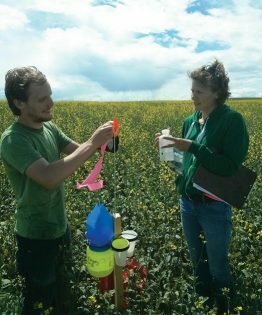 Sarah Johnson and Michael Gavin collect insects in a canola field near Okotoks, Alta., as part of Paul Galpern’s biodiversity study. Surveillance networks for beneficial insects: Can natural habitats serve as insect reservoirs, and do they contribute to canola yield? 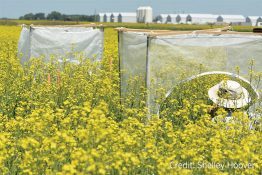 between the diversity and abundance of beneficial insects and canola production in Western Canada. Specifically, it will address the role of natural habitats near canola fields as reservoirs for pollinators and natural enemies of canola pests as well as the capacity of these beneficial insects to increase seed yield through pollination and pest reduction. Progress: Data collection on the diversity and abundance of pollinators near canola fields began in 2016, as did a pilot study to collect and identify natural enemies. The first meeting of the Prairie Beneficial Insect Working Group, an advisory group of academic and government researchers as well as representatives from the Canola Council of Canada, has been scheduled for November. Qualified personnel will identify insect specimens and analyze canola yield and insect diversity data. Purpose: The aim is to develop a complete population dynamics model for swede midge. The model will be used to explore differences among North American populations of swede midge and will try to predict the lag time between first detection in an area and subsequent occurrence of economically damaging populations. the time from detection to economic damage is being assessed. AAFC swede midge researcher Boyd Mori checks an early season swede midge pheromone trap. Purpose: Year 1 of 4. The purpose is to investigate host plant susceptibility or resistance factors to swede midge, with the ultimate aim of identifying host plant resistance. 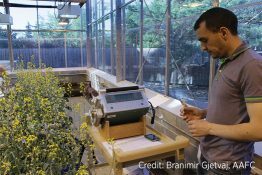 Progress: Researchers are currently growing plants from a collection of plant species known to be swede midge hosts or non-hosts, creating a colony of swede midge for laboratory bioassays, and developing bioassay techniques to start experiments on midge-plant interactions. Purpose: The aim is to develop and implement a provincial weather-based, near real-time (NRT) insect pest prediction model as a web-based risk management tool for three significant insect pests: bertha armyworm, alfalfa weevil and wheat midge. The models will provide a timely prediction of the pests and assist in devising effective pest management practices. Progress: Year 2 of 3. The final field season concluded with data collection on phenology (seasonal cycles) and life history of three pests and their natural enemies along with crop phenology monitoring across 26 sites in Alberta. Pest phenological monitoring procedures included yellow sticky traps for wheat midge females and parasitoids, spring soil sampling to predict midge emergence and scouting for second-generation alfalfa weevil adults. Quality control and analysis on collected field data leading to improved phenology models for each species is currently underway. Purpose: The aim is to develop and implement insect surveillance programs to identify risks to crop production from pest species and to highlight and conserve their natural enemies. Progress: Year 3 of 5. Data from annual surveys in 2016 provided a snapshot of current pest status and reflected the future risks to varying degrees. Provincial and industry collaborators, together with project team members, monitored over 4,000 sites for grasshoppers, 700 for wheat midge, 800 for cabbage seedpod weevil, 500 for bertha armyworm, 200 for pea leaf weevil and 95 for wheat stem sawfly. In addition, sentinel sites were monitored for flea beetles, cutworms, swede midge and cereal leaf beetle. Weekly updates were provided using the Prairie Pest Monitoring Network blog. Verticillium longisporum in Manitoba: Understanding the pathogen and establishing surveillance capacity. MB Grain Hub, GF2 and WGRF. Progress: The farm found to have V. longisporum was sampled. Hundreds of other samples were also collected for quantification of V. longisporum at the Pest Surveillance Laboratory (PSI) in Winnipeg. Training of PSI personnel in the extraction protocol has begun. Progress: A Sclerotinia sclerotiorum ascospore trap has been selected and spore trapping under greenhouse conditions was successful. An electrode nano-chip to detect spores has also been designed and tested. Current work is putting these two together and testing the device in a greenhouse. Funding: SaskCanola, Alberta Canola, MCGA, WGRF, ACIDF, ARDI and seed companies. Purpose: To analyze and monitor the blackleg pathogen population using Westar trap plots scattered on the Prairies. This will provide industry with up-to-date pictures of L. maculans race structure, as well as the pathogen race dynamics to guide cultivar selection and rotation. Selected fields with different blackleg severity will be investigated to understand the role of L. maculans race changes in causing the cultivar to lose the resistance. Progress: A total of 334 L. maculans isolates from the 17 Westar trap plots across the Prairies were tested using a differential set of Brassica lines for Avr profile. Results showed that AvrLm1, AvrLm3, AvrLm9, AvrLep1 and AvrLep2 were either very low or undetectable in the pathogen population while AvrLm2, AvrLm4, AvrLm6 and AvrLm7 were found in more than 50 per cent of isolates. However, AvrLm4 in Alberta remained lower (20-40 per cent) than in other provinces, and AvrLm2 and AvrLm6 were noticeably lower than in 2015 in Manitoba. This information can help the selection of specific R genes for blackleg resistance breeding. Purpose: This study aims to characterize blackleg resistance used in western Canada, and assess potential influence of environmental factors, especially hot, dry conditions, on the expression of resistance to better understand the mechanisms of different types of resistance. effective in most regions of western Canada. Purpose: Objectives are to monitor spread of novel clubroot strains through surveys, assess the potential of novel pathotypes to reappear, characterize the pathotypes of clubroot that appear where resistance has broken down and multiply inoculum of novel pathotype(s) for resistance screening. Progress: Pathogen strains capable of overcoming clubroot resistance have been identified in 42 fields. These fields are located mainly in central Alberta but with isolated cases found up to about 600 km apart. Eleven distinct strains have been identified, based on their virulence on a putative Canadian Clubroot Differential Set. Strains collected in 2016 will be characterized over the fall and winter under controlled conditions. Purpose: The aim is to develop a better understanding of the distribution and dispersal of clubroot and to develop methods to eradicate or reduce newly established infestations within fields and on a regional basis. Progress: Application rates of Vapam fumigant had a significant effect on canola stand establishment, plant height, pod number, seed yield and disease severity at both field sites. Disease severity and gall weight decreased as the Vapam rates increased. However, it should be noted that Vapam is a non-selective toxin. It is both volatile and highly soluble in water and as such constitutes a hazard to human health, as well as to non-target organisms in the area surrounding its application. Applicators must follow all regulations regarding its use and adhere to the label recommendations. 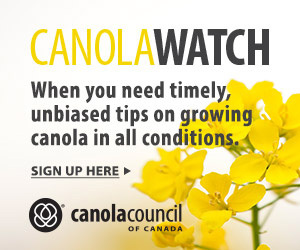 Purpose: The objective is to determine if Canadian canola cultivars can be organized into resistance groups that would allow producers to choose cultivars with different blackleg resistance genes from those previously seeded. Progress: Initial testing of a small set of commercial cultivars showed that cultivars appeared to divide into two groups on the basis of presence of the Rlm3 resistance gene. On the basis of this preliminary grouping, researchers identified fields in Alberta where the seeded cultivar was known and compared field and controlled-environment performance against blackleg. These data further supported a resistance group model with two cultivar groups. Next, they evaluated cultivars against field-collected residues from a wider range of collection locations. They also applied a new testing technique that corrects for different levels of inoculum in different residue samples and also allows seedlings and rosette-stage plants to be inoculated. When looking at wound-inoculated cotyledons, they found that all cultivars were equally, and highly susceptible to blackleg. This was true regardless of the source of the L. maculans population. 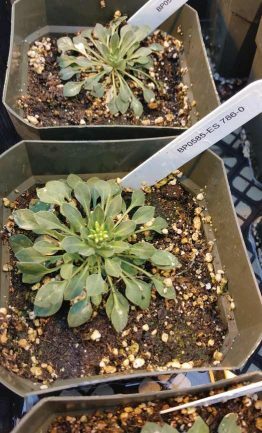 When cotyledon-inoculated plants were allowed to reach maturity, or when plants were spray-inoculated, differences among cultivars and variability among locations were observed. Researchers will complete analysis of results before making any revisions to the putative resistance groups. Supporting continued development of clubroot-resistant canola and early detection of clubroot outbreaks. Purpose: The objectives are to evaluate canola lines and cultivars for their various levels of resistance to P. brassicae (pathotype 5) and evaluate the efficacy of soil amendments and treatments for clubroot management. Additionally, the project enhances clubroot surveillance in southern Alberta in attempts to rapidly identify any new introductions or outbreaks of clubroot south of Highway 1. Progress: Year 4 of 4. Since 2013, dozens of new lines/cultivars have been screened for resistance at this disease nursery and a number of them have shown strong resistance to pathotype 5. Soil amendments and chemical fumigants have demonstrated limited ability to provide significant or consistent control of clubroot in areas with high resting-spore populations. Clubroot surveillance has not discovered any new infestations south of Highway 1. Purpose: The objectives were to look for synergistic relationships between foliar-applied micronutrients and fungicides when tank mixed, and to evaluate the efficacies of “resistance-priming” chemicals as seed treatments to improve sclerotinia management. Progress: Year 4 of 4. A few synergistic combinations appeared in some years, however none of the tank-mixed treatments were consistent in all years tested. One of the resistance-priming chemicals applied to seed has shown significant white mould reduction in two of three years in dry bean but none of these compounds have shown any significant effect on stem rot in canola. Dry conditions in 2015 resulted in very little sclerotinia disease pressure, making it difficult to evaluate these seed and foliar-applied treatments, but 2016 provided ideal conditions for sclerotinia development. Results from 2016 and a final report for the project will be submitted in 2017. Purpose: The aim is to determine if aeration or turning of canola in the spring results in more stable storage conditions throughout the summer than leaving it alone. Data collected in 2016 was used to validate results collected in 2014.
average moisture content of the stored canola was nine per cent (compared to the 6.5 per cent canola monitored in 2014). Results indicated that no significant condensation or moisture migration occurred in any of the bins, but the baseline (control) bin had the most stable conditions throughout the summer and the coolest core (4°C) at the end of the monitoring period. three test locations: Indian Head, Swift Current and Humboldt. performance. Seed losses attributable to active knife dividers (rotary and vertical knives) were also compared to standard fixed dividers. These and other header-related comparisons continued through the fall of 2016, and full results will be released in early spring 2017. Purpose: Year 2 of 4. The project aims to identify new sources of B. napus for resistance to pathotype 5x, map clubroot resistance (CR) genes and develop markers tightly linked to the genes for use in marker-assisted reeding. It will then work to facilitate the rapid incorporation of multiple CR genes into elite canola breeding lines. Purpose: Year 3 of 4. This project aims to develop B. napus lines each with a single unique clubroot resistance gene from Brassica vegetable species. These lines could be used for differentiating pathotypes of P. brassicae and rapid incorporation into canola variety development programs. Progress: Researchers have obtained BC2, BC3 and BC4 introgressed B. napus lines containing eight single clubroot resistance genes. Purpose: The aim is to identify, using molecular cytogenetic study, the B-genome chromosomes of Brassica carinata carrying cotyledon and adult plant resistance to blackleg PG4-type isolate. The purpose is to identify resistance for introgression into B. napus. Progress: Research has identified one B-genome chromosome of B. carinata carrying resistance to a PG2-type isolate. However, this resistance gene alone does not confer resistance to the more virulent isolates, despite B. carinata showing resistance to these isolates. This indicates that more than one gene in B. carinata may be involved in the control of resistance to these isolates. Identification of additional genes in B. carinata for introgression into B. napus is in progress. Tim Sharbel is working on the genome of boechera (shown), a wild Brassicaceae that can produce seeds without pollen (male) fertilization. This apomixis trait could be valuable for canola seed production. and rapidly breed varieties adapted to changing environmental conditions. Purpose: Year 2 of 4. 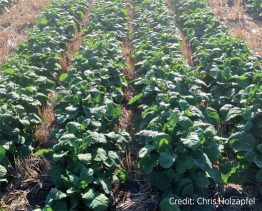 The project aims to identify clubroot resistance and blackleg resistance genes in B. nigra and transfer the genes into canola. Progress: Researchers have genetically mapped a clubroot resistance gene in B. nigra and obtained BC1 progenies from interspecific crosses between B. napus and the B. nigra line. 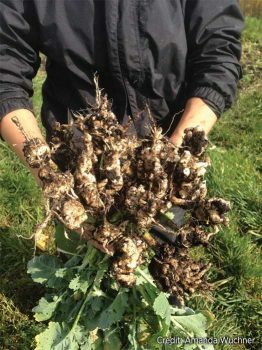 Both clubroot and blackleg resistances in the BC1 populations have been confirmed. Progress: Initially, the work has been focused on the assessment of 19 single and multi-gene hybrids against different populations of the pathotype 5x identified in Alberta. There is differentiation of resistance depending on the population, but two of the multi-gene combinations seemed provide substantial resistance relative to the control 45H29. Purpose: This study aims to broaden the genetic pool available for canola breeding, capturing diversity from all available collections of annual B. napus. The project will also provide the tools for rapidly introducing valuable variation into cultivar development. Progress: Highly diverse founder lines were selected and the final lines have been developed for a structured population, which will be used to characterize traits of interest and quickly move novel beneficial alleles into breeding lines. Extensive phenotyping of the founder lines has been completed in the field and genotyping is ongoing to develop marker resources to facilitate the transfer of identified valuable variation for target traits. In Western Canada, most of our canola varieties don’t carry the specific blackleg resistance (R) genes corresponding to any of the prevalent Avr genes in the current pathogen population, and the resistance to blackleg appears to rely primarily on race-non-specific (quantitative) resistance. Traditionally the latter is more difficult to identify because it relies on extensive field experimentation and can often be influenced by the environment. 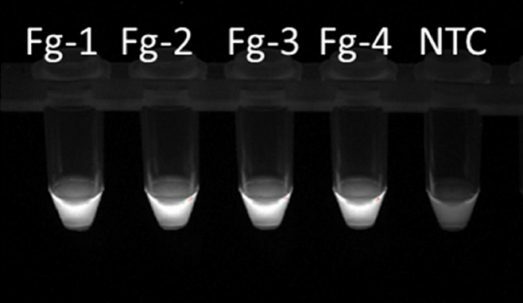 We tried to develop a lab-based assay to characterize and verify the non-specific resistance using a transformed pathogen isolate carrying a green-fluorescent-protein (GFP) gene and droplet digital PCR (ddPCR) to track the pathogen spread and quantify the infection development. Wow, the technologies are amazing! The green fluorescence followed the moment of pathogen hyphae vividly in canola tissues, showing that some varieties may prevent the pathogen in infected cotyledons from reaching the stem before the leaf drops off. The ddPCR, in combination with the GFP labelling, identified the varieties that reduced the infection development in stem tissues despite the establishment of pathogen there. Using theses technologies, we now can screen and characterize quantitative resistance to blackleg in our canola germplasm more efficiently under controlled environment conditions. Clubroot of canola pathotype characterization. The lab is culturing isolates from the samples it collected over the past year. This is timely as seed companies are marketing ‘resistant to pathotype YY’ varieties but growers and extension workers do not know what is present in the Manitoba environment. The lab is exploring tools that would eventually move it from plant-based to DNA-based assays. PSI is collecting blackleg samples to build its isolate base and eventual assay development. Verticillium in canola. PSI is working with MCGA, Richardson International and the University of Manitoba on the development and validation of a DNA assay for V. longisporum. The lab will offer testing to growers once the method is validated and once the regulated status of the pathogen allows us to test beyond the research environment. Glyphosate resistant (GR) kochia DNA assay. A pilot project from last fall indicated GR resistance in pockets around southern Manitoba. This year, the lab is expanding the pilot to collect and characterize more samples. PSI could also expand into other DNA-based assays for herbicide class and weed species. Manitoba Canola Growers Association, which funds the PSI Lab, received support from GF2 to expand the lab’s services.